If there is one thing that I could wear every day, it's a knit skirt. In fact, chances are that most days I am wearing a knit skirt. Yet outside of one of my first sewing projects which involved successfully sewing knits, I haven't had much luck with this ubiquitous, stretchy fabric. I've attempted it several times. Oh trust me, I have. But each time has turned into one big frustrating disaster. I decided that knits were not for me. Then I got pregnant. My burgeoning belly has long outgrown my previous skirts. 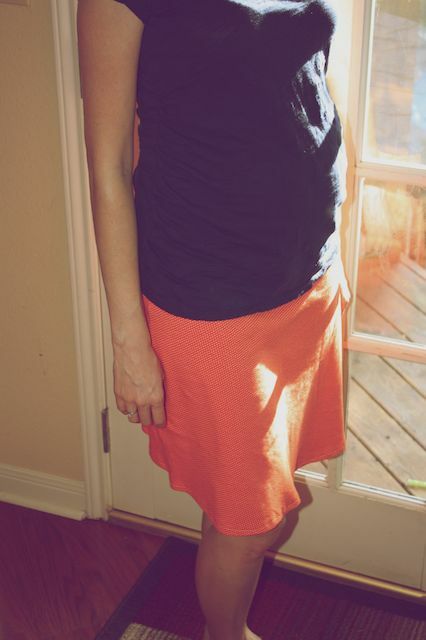 When it came time to look for new ones, I was shocked by the cost of maternity clothes. A trip through the non maternity section proved fruitless as well. So I decided to take matters into my own hands and give knits another try. I started with a high quality knit fabric (though still about half the cost of what I was finding in the store). 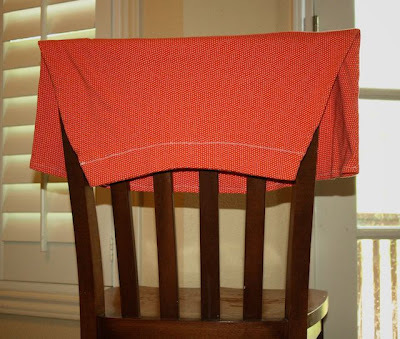 I read this tutorial on sewing knits. Then I followed about half of it. When I made my first knit skirt, I did everything wrong. I used a straight stitch on the whole thing. I used a universal needle instead a ball point. I didn't finish any of the seams. It's held up through two years of weekly wear. Beginner's luck? Maybe. But I didn't want to deviate too much from what worked. This time I did use a ball point needle. I also used a pinking shears on the seams and a zigzag stitch around the waist seam only. I pre-shrunk the fabric, as I always do. But I kept it simple. It worked. I didn't use a pattern, instead I traced a favorite skirt adding a half inch for the seam allowance and a couple of extra inches around the waistline. I made a wide waistband, imitating my other knit skirts. Because of the stretchiness of the fabric, no elastic or zipper is needed. It took some time and patience to get the fit exactly right, but the sewing part was a breeze. I think the secret is in finding fabric that is stretchy, but not too stretchy. It's not fancy, but it's exactly what I needed. And I might have even overcome my fear of sewing knits along the way. YES! shannon, my #1 problem is that i just don't have the time or inclination to spend much time shopping. there's so much i'd rather do with my free time than shop and shopping with three kids ages 2, 4, and 6? a total nightmare! thanks for the tip! i appreciate it!